Your Source For Ski Resort Deals. Ski vacation packages to Alaska. Take advantage of our deals, discounts, the best planning advice, or create your own ski / snowboard package. 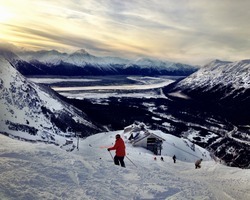 Alyeska which means "great land" is an alpine ski area near Girdwood that is located 35 miles southeast of Anchorage. This ski resort is also Chugach Mountain's gateway that is home to an array of wildlife and flora species. During winter, Alyeska becomes a haven for all levels of skiers. The place offers an abundant 650" of average annual snowfall scattered around the 1,400 skiable acres which is comprised of 73 named trails. Advanced skiers can also venture the 2,300 ft Mt. Alyeska trail on foot or take the scenic Aerial Tram to appreciate endless Alaskan views. With the best lodging options set in stunning mountain views, Alyeska intertwines luxury accommodation with the convenience of nature as well as unmatched mountain experience.